Herring spoils so fast it is almost always eaten salted, pickled or smoked. 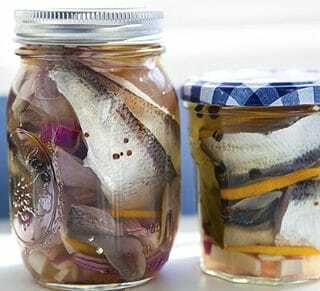 I’ve eaten (and made) herring in all these forms, but there is something special that makes pickled herring so popular, especially in Northern Europe. I think it’s because the acidic twang of the vinegar and lemon counteract the rich fattiness of the herring fillets — these fish are among the foods highest in healthy omega-3 fatty acids. The addition of spices, sugar and onion add a personal touch. This particular recipe is for Swedish glasmastarsill, or glassblower’s herring. Why it is called that I have no idea. Best I can tell it is because this pickle is always put up in glass jars, with the silvery skin of the herring facing outward. Let’s face it, folks: For a pickled little bony fish, this is as pretty as it gets. 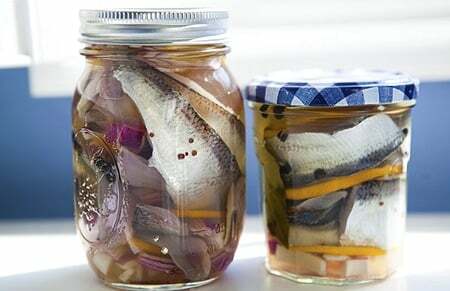 Most pickled herring recipes start with pre-salted herring — the kind that come in cans. If you use these, skip the salt in the initial brine and soak the fish in fresh water overnight. They’ll still be plenty salty. Having some salt in the fish is important: I once made this recipe with fresh herring that I failed to brine, and they turned to mush within 2 weeks. A disaster. You need the salt to extract extra moisture from the fish and keep them firm. I like these just as a snack, with pumpernickel or rye bread, potatoes of any kind, hard-boiled eggs — or just on a cracker. Heat 4 cups of water enough to dissolve salt. Let this brine cool to room temperature. When it does, submerge the herring fillets in the brine and refrigerate overnight, or up to 24 hours. Meanwhile, bring the sugar, vinegar, the remaining cup of water and all the spices to a boil. Simmer 5 minutes, then turn off the heat and let this steep until cool. When the herring have brined, layer them in a glass jar with the sliced lemon and red onion. Divide the spices between your containers if you are using more than one. Pour over the cooled pickling liquid and seal the jars. Wait at least a day before eating. Store in the fridge for up to 1 month. 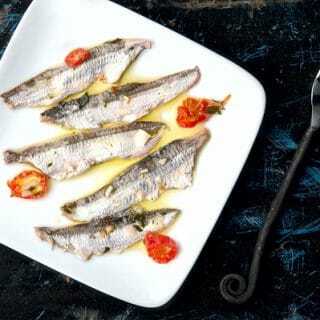 You can find many more recipes for herring, anchovies, sardines, as well as other underappreciated species right here on Hunter Angler Gardener Cook!